RECAP-Free Spay and Neuter Clinics a Success! As part of giving back to the community, Lovebugs Rescue partnered with Lucy Pet Foundation and OC Animal Care to provide FREE spay and neuter clinics to 54 Orange County resident’s pets. These clinics were 100% paid for by Lovebugs Rescue. Each registered animal became part of the pet overpopulation solution, which means less unplanned litters and less dogs being euthanized in the shelters. A total of 54 dogs and cats had surgery, as well as all receiving a rabies vaccine and a registered microchip. 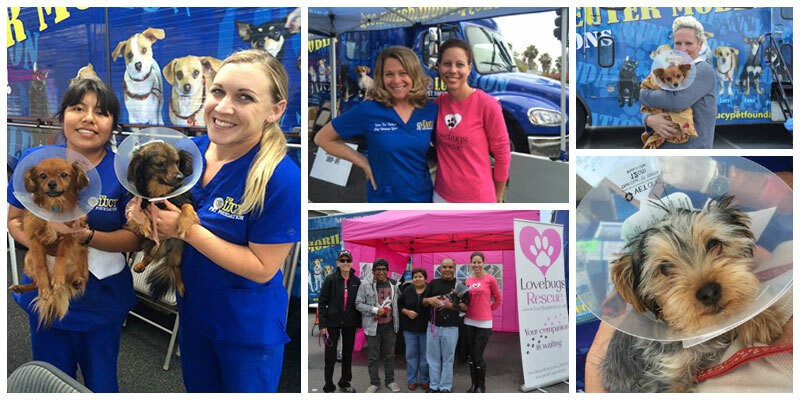 The Lucy Pet Foundation mobile clinic was easy to spot in the OC Animal Care parking lot, alongside Lovebugs Rescue’s signature pink information booth. All animals had to register in advance due to pre-surgery requirements.